Do you need both Too Faced Born This Way Concealers? When I saw that Too Faced were releasing a second concealer in the Born This Way line, I was very curious. 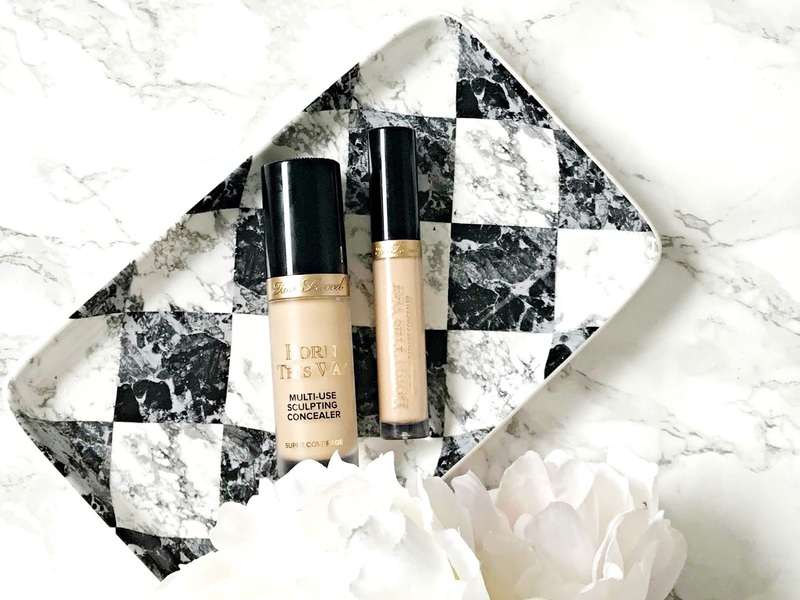 At first I thought that the original Naturally Radiant Concealer might be discontinued but it isn't and the two concealers are pretty different so I want to share my thoughts on whether you need both with you today. Too Faced Born This Way Naturally Radiant Concealer: The initial release in the Born This Way line, this concealer has a doe foot applicator and is a light texture, hydrating and gives medium coverage. I personally love this concealer as I have dry skin and it doesn't settle into fine lines or crease, making it ideal for the under eye area. If you have very dark under eye circles, you may need a corrector with this but I personally don't. I find that the finish is radiant without being pearlescent, so it's perfect for the under eyes but not necessarily for blemishes where a matte concealer would be better suited. This is one of my favourite concealers as it ticks all of the boxes for me. £20 for 7ml. Too Faced Born This Way Super Coverage Multi-Use Sculpting Concealer: This has double the amount of product than the other concealer and the applicator is around three times the size of the original. It is very similar to the Tarte Tape Shape applicator and also similar in consistency. I assume the reason for the large applicator is because it is designed to be used as a contour or highlighter and, therefore, for larger areas of the face, a large applicator is more suitable. I only bought one shade so just use it as concealer but it's still ok size-wise to use around the eyes. I personally prefer to apply some to my hand and use a brush to apply to my face. The formula is much thicker than the original concealer, yet somehow it blends well, doesn't highlight fine lines and doesn't crease. I'm quite amazed by it as I don't usually like very creamy formulas as they can feel heavy on the skin, but this one doesn't. It packs a serious punch in terms of coverage - dark circles and spots don't stand a chance against it and it's super long-lasting. When I remove my makeup, it looks exactly how it was when I applied it. I can't really find anything negative to say about it. If you like the Tarte Tape Shape, you will love this - I personally prefer it! £24 for 15ml. Also available from Ulta if you are in the U.S.A. and you can find a coupon to save money here. If you have very dark circles or acne, the new Super Coverage concealer would be best for you but if you don't need very much coverage then you would probably prefer the original Naturally Radiant option. Have you tried either of these concealers? I'd love to hear your thoughts!